A kitchen isn’t always just the place we prepare our meals. It can be a second living room where families interact. Maybe it’s time to upgrade those cabinets that don’t close all the way or trade that island in for something a little more storage friendly. 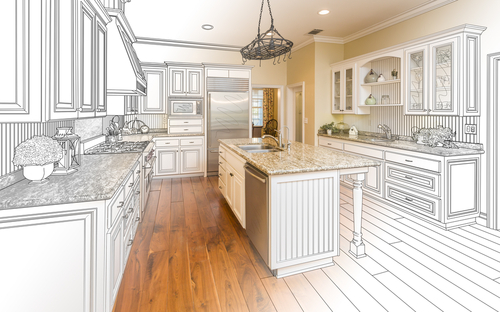 If you’re tired of going back and forth with yourself about whether you think your kitchen needs a remodel, you should consider asking yourself these important questions. How will you use your kitchen? Do you enjoy putting on a show for guests as you try to perfect your turkey every Thanksgiving? If so then a custom kitchen may be all that separates you from the parties and holidays you always strived for. If you’re not striving the best the best cook, then perhaps you’d like a kitchen with newer appliances and more space for when you have guests over. A kitchen is an investment that should be tailored to your lifestyle. How much will you be able to invest? Anything worth doing is worth doing right…within your budget. To come up with a number, you’ll find reasonable, examine your kitchen for surfaces, appliances, and fixtures you think are worth keeping. In some cases, this drops the bottom line figure significantly. Another way to combat your urge to spend is making a list of what you think are needs and wants. When you feel that you’re going to be over budget, cross out things on your want list. What style of kitchen? Do you want a modern kitchen or something more classic? Answering this one may be harder than it seems. It impacts on the future sale of your home, if you ever decide to do so, could mean you are making more back than you invested in the remodel. Timeless kitchens age well but don’t quite excite buyers, while modern kitchens can attract buyers while they’re still trendy. Of course, the biggest factor is taste if you’re the homeowner. Getting a well functioning and family friendly kitchen isn’t always quite as simple we’d like it to be! However, with the right questions and detailed planning, it’s a lot easier to get what you want. Get in touch for further inquiries at 215-372-0040!